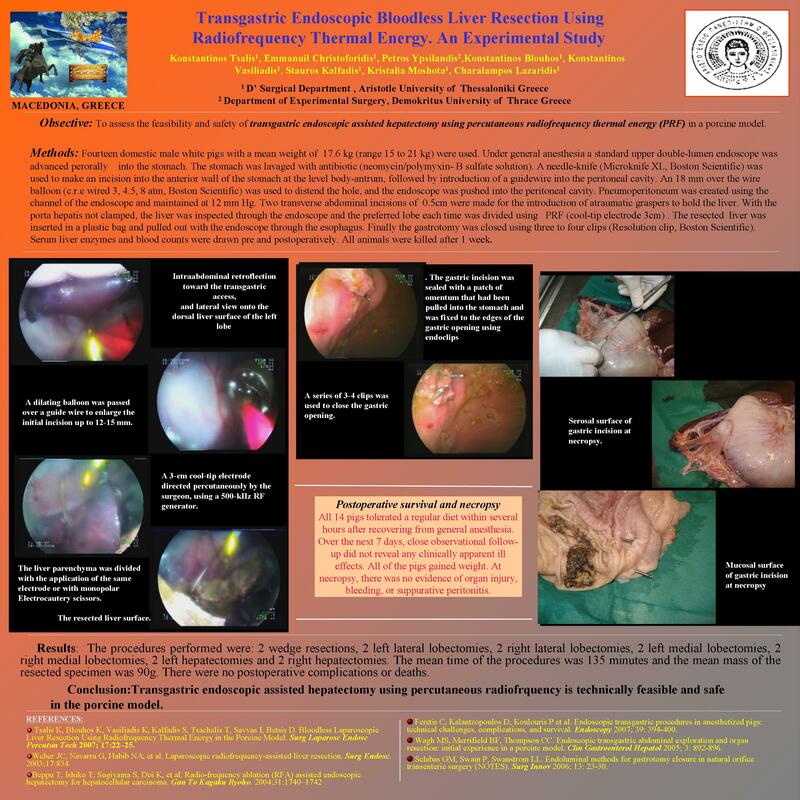 Obsective: To assess the feasibility and safety of transgastric endoscopic assisted hepatectomy using percutaneous radiofrequency thermal energy(PRF) in a porcine model. Methods: Fourteen domestic male white pigs with a mean weight of 17.6 kg (range 15 to 21 kg) were used. Under general anesthesia a standard upper double-lumen endoscope was advanced perorally into the stomach A needle-knife was used to make an incision into the anterior wall of the stomach , followed by introduction of a guidewire into the peritoneal cavity. An 18 mm over the wire balloon was used to distend the hole, and the endoscope was pushed into the peritoneal cavity. Pneumoperitoneum was created using the channel of the endoscope. Two trocars of 0.5cm were placed for the introduction of atraumatic graspers to hold the liver. With the porta hepatis not clamped, the preferred lobe each time was divided using PRF . The resected liver was inserted in a plastic bag and pulled out with the endoscope through the esophagus. Finally the gastrotomy was closed using three to four clips. Serum liver enzymes and blood counts were drawn pre and postoperatively. All animals were killed after 1 week. Results:The procedures performed were:2 wedge resections, 2 left lateral lobectomies, 2 right lateral lobectomies, 2 left medial lobectomies, 2 right medial lobectomies, 2 left hepatectomies and 2 right hepatectomies. The mean time of the procedures was 135 minutes and the mean mass of the resected specimen was 90g. There were no postoperative complications or deaths.